John Houghton has written an excellent blog this week for New Start magazine called 'Exposing the Lie' http://www.cles.org.uk/yourblogs/exposing-the-lie/. In the blog John challenges the notion that people living in the most economically disadvantaged communities do not care about the plans and decisions that affect their lives. John's blog took me back to the work I did with ecumenical colleagues in the churches in Bradford in 1994. 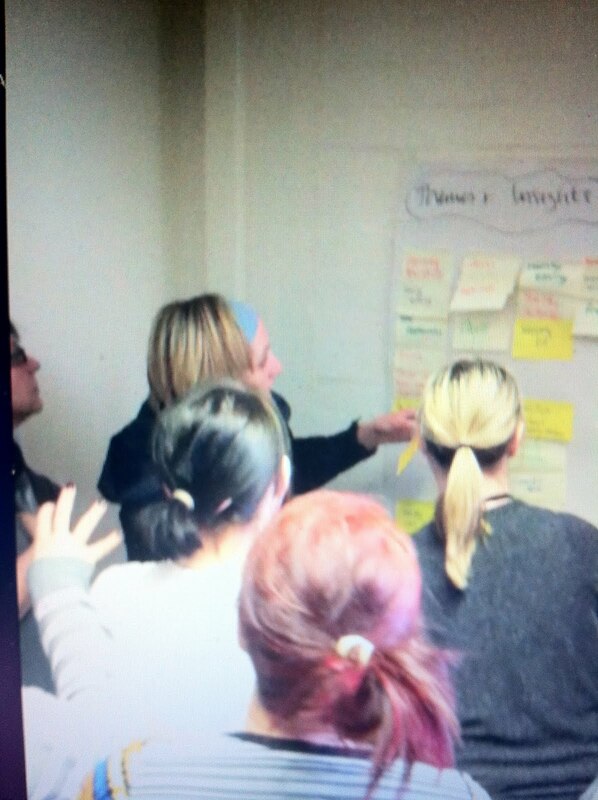 Called 'Powerful Whispers', it involved the Bradford Metropolitan District's top decision-makers listening to local people speak in four two hour sessions. Each session was held in one of four of the District's most disadvantaged communities. The decision-makers were asked to listen in silence, without response, as people talked about their lives and communities. This was to enable them to really listen without being distracted by thoughts of how they ought to respond. What is good about where you live? What are you already doing to make a difference? From the four Hearings a colleague and I drew out the key issues. For the first time the issue of consultation and decision-making arose. I quote it in full because, from John's blog, clearly it is still relevant. 'When resources are scarce, and the problems which need addressing are many, the quality of decision-making becomes crucial. Decisions have to be clear, and the reasoning behind them absolutely transparent, if people are going to accept decisions as being fair. As the four steering groups prepared for the Hearings, it became obvious that people in areas which had not received regeneration mony from schemes such as City Challenge or the Single Regeneration Budget were feeling disappointed and a little bitter. Ironically feelings were also running very high on Holmewood, which has had very substantial funding from City Challenge. Holmewood demonstrates that spending money is not in itself the key; great attention needs to be given to the way it is spent. Time and again we were given examples of what local people thought was money being inappropriately spent on projects which had not originated within the community. They pointed out that thousands of pounds had been spent on hiring 'consultants' to canvass local opinions. Yet those consultation exercises were felt to be cosmetic. The view was that where local opinion did not coincide with that of those running City Challenge, then people felt that their ideas were ignored. This had led to cynicism about being consulted. On the other hand there are people involved with the running of City Challenge who feel that serious efforts have been made to involve local people at every stage. This is causing tension and there is the possibility that some of the strong community roots put down over the years are being undermined. Consulting people is never a simple process. People are often reluctant to express opinions or lack the confidence to contribute ideas. They often feel that they do not have the knowledge to participate. The usual methods of questionnaire and public meeting are limited to drawing from people the kinds of issues which concern them and their families. People who are struggling to survive do not necessarily complain the loudest! There needs to be clear recognition that real consultation is expensive in terms of time, as well as money, in those communities which have the most problems but that this expenditure can represent a sound investment. If Bradford is going to be able to cope with scarce resources and growing needs, then creative ways have to be found of including citizens in decision-making. People need to be helped to think about their own locality but also to develop a wider picture of concern and awareness. The next twelve years of my working life in the District was spent turning this desire into a reality. My current work with people with diabetes and health/social care staff has kept me alert to 'twitter' postings about 'engagement' issues. ''NHS leaders favour ‘pace-setting’ styles focused more on the delivery of targets than engaging patients and staff. The business case for leadership and engagement is compelling: organisations with engaged staff deliver better patient experience, fewer errors, lower infection and mortality rates, stronger financial management, higher staff morale and motivation and less absenteeism and stress. Patient engagement can deliver more appropriate care and improved outcomes." When working with senior public service leaders, I too have noticed just how 'task driven' they are. Their eye is always on the next thing to do. It is ironic that their proper desire to deliver the best services is undermined by their own busyness. It is doubly ironic that what would improve their ability to deliver better services is right under their noses - the knowledge, experience and ideas of staff and patients (or clients or customers in other settings). In designing interventions aimed at reducing the number of people with diabetes who lose their sight, I have been working with patients and staff. If anyone had been listening in to the conversations with the two groups of patients, they would have been surprised by the simplicity of those conversations. Yet the insights that came out are profound. So if you can't afford world class academics or consultants to help you improve your business, just listen to your people! One of the comments that struck me in Peter Diamandis' TED talk, posted in yesterday's blog, was that three billion new minds will become connected to the internet by 2020. Three billion new voices that have never been heard before in the wider world, with the ability to create infinite new possibilities. We don't have to wait for 2020 for this phenomenon to materialise. Wherever you look, in workplaces and communities, there are voices that have never been heard beyond families or immediate work teams. Voices belonging to brains that teem with intelligence and ideas for transforming businesses and communities. One of the joys of my work is to help organisations bring together people from within and without their organisation, to apply their brains together to create new possibilities. Last week it was 200 people from public services, communities and businesses coming together to explore how they could each contribute to improving the lives of everyone living in a particular local authority area. We brought our individual stories, thoughts and ideas to bear on the task. These were distilled to create priorities. People brainstormed their ideas for small actions that would make a big difference with current resources. And bold actions that could transform. They then signed up to helping implement those bold ideas. The Leader of the Council wrote to me afterwards saying that people had said to him how much they appreciated being listened to. They felt that there had been a genuine reaching out to them. If this is followed up with support to the people who have signed up to act, then a whole new set of relationships and connections will have been started. New connections that will lead to a whole new world of possibilities. ﻿Reaching my late fifties, and with a first grandchild's life budding, thoughts of the future abound. Doom and gloom seems to be the forecast for coming generations, particularly in terms of the environment. This talk from Peter Diamandis at TED 2012 demonstrates my own belief in the capacity of human beings to innovate in ways that will build a positive future - despite the seeming evidence to the contrary. Enjoy! 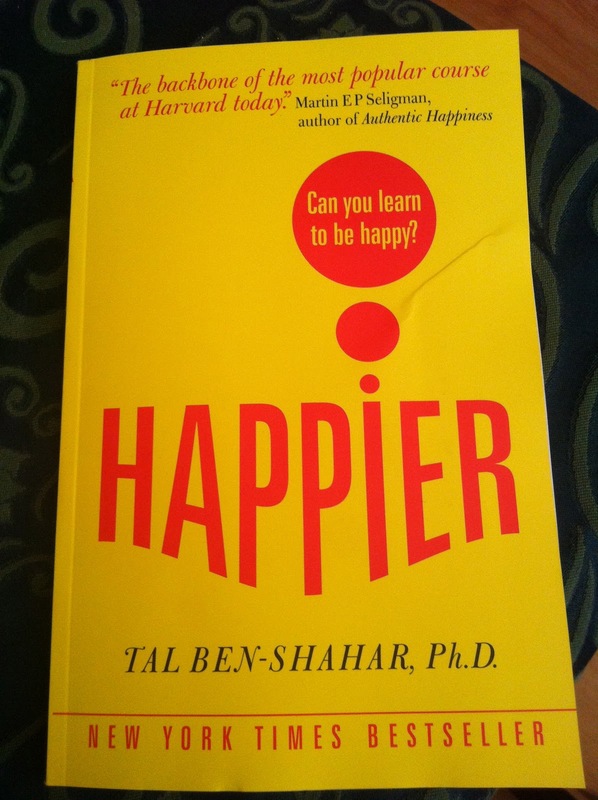 What do self-control and resilience have to do with happiness? Two pieces in 'The Observer' caught my eye this last week-end. Well it turns out that the extent to which children are able to defer their gratification at the age of four, is a predictor of future performance. Out of more than thirty personality traits used to compare students, only self-control turned out to be an accurate predictor of grade point average. Baumeister and Tierney posit: ' Self-control is ultimately about much more than self-help. It's essential for savouring your time on earth and sharing joy with the people you love. People with strong willpower are more altruistic. They are more likely to donate to charity, to do volunteer work and to offer their own homes as shelter to someone with no place to go.' They believe that willpower evolved to help us get along that little bit better with other people. Sounds to me like self-control has an important contribution to make to our sense of well-being and happiness. Which takes me nicely to the second thing to catch my eye. This was a report on Labour's shadow health secretary, Andy Burnham"s warning to the coalition about its 'happiness agenda'. Burnham argued that there needs to be more action to help people cope with the stresses of life. He believes that the priority should be to provide support to help people build up resilience to better withstand hard times. In fact building resilience and the nurturing of happiness are connected. People can learn to notice the many small good things in everyday life, and to be consciously thankful for them. This in turn builds strength and resilience. There is good evidence of the extent to which people can be taught how to nurture happiness as a way to overcome depression and handle the tough things in life. Have a look at positive psychologists Barbara Fredrickson's research work on positive emotion and Martin Seligman's work on resilience to learn more. 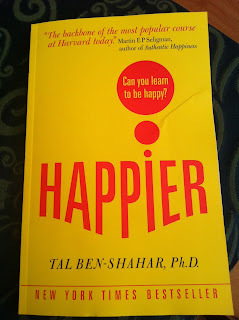 So I was doubly pleased to get as a freebie with my Sunday paper Tal Ben-Shahar's book 'Happier'. Lots of tactics in there to help me build up my resilience through self-control, altruism and noticing and appreciating all that is good, better and best in my own life. Next month I am going on pilgrimage to the Holy Land to visit the sites associated with the life and ministry of Jesus. What though of contemporary sites of hope and vision for peace in the places that I will visit? This week-end, thinking about this, I realised that I did know of one. When studying with David Cooperrider, co-originator of Appreciative Inquiry, he was explaining to us the concept of 'appreciative intelligence', the ability to see 'the mighty oak in the acorn'. To illustrate this he told us the story of Stef Wertheimer. David had been giving a lecture at the Arison School of Management in Israel. He raised questions of where peace was to come from. From the military? From governments? From religious leaders? All he felt were unlikely. He argued that the world of business could be 'the most important ground and force for peace'. Though at that point he said hadn't any examples to back up his thesis! After the lecture, David was approached by a businessman, Stef Wertheimer, who invited him to go the next day to see this thesis in action. On a once barren hilltop, Wertheimer has created the Tefen industrial park surrounded by beautiful homes and neighbourhoods. As well making money, attention is paid to the social, educational and cultural life of the community that lives there. Wertheimer describes it as a 'capitalist kibbutz'. David told us: 'The whole park is based on the principle of co-existence, Arab and Jewish living together, going into business together, building schools and museums together, and dramatically transforming entrenched conflicts into collaborative energies for economic empowerment, development and peace'. In the book Stef Wertheimer gives his thinking behind the inspiration: 'Our survival in this region depends, ultimately, on the resolution of current conflicts. Alongside the security issues there must, however, be a road map for economic development, for industrialization, for job creation and for export production. Only by increasing the income levels of all countries in the region, will we begin to reduce the immense friction of disparities between neighboring countries and between the Middle East and the developed nations. While the Middle East produces 60% of the world's oil, it manufactures just 2% of the world's goods. With high levels of unemployment in the Arab countries and a rapidly increasing young population, there is a desperate need to generate meaningful employment opportunities and the hope for a better future. For me, the term “Middle East” has no real meaning. Rather, I see two areas separated by their ownership of oil resources, whereby those of us without oil are the eastern Mediterranean countries that formed the old “Levant”. Among the “non-oil” countries are those that would choose to compete on world markets and seek economic independence such as Jordan, Turkey, Israel and, potentially, Lebanon and the Palestinian Authority. Successful advancement along this path can lead the countries of our region towards the creation of a thriving economy, towards a work ethic based on reason and responsibility and towards the achievement of peaceful coexistence between like-minded neighbors. Perhaps the Tefen Model, as well as a vital path to peace, has something else to show us. The growing wave of protest about the austerity we are all having to embrace because of the misdeeds of financiers, signals a growing desire for more responsible ways to create wealth. Does the Tefen Model of collaborative enterprise, where profit is created and some of it invested in the development of quality, healthy communities, show us a more humane version of wealth creation? - What best helps families with complex needs to become stable? - What else needs to happen to prevent people of Pakistani descent losing their sight, as a result of diabetes? - What can we do to help young people use alcohol more wisely? These three major questions have been occupying my work and waking life over the past six months. In each case the work involved asking those with the inside knowledge - the families, people of Pakistani descent and young people and their parents. Of course, we listened to what all the relevant professionals had to say as well. In fact we listened to the 'whole system' i.e. everyone who had a contribution to make in one way or another, to the issue being considered. There was thoughtfulness and animation in the focus group discussions; a real willingness to share experiences generously, even painful ones, in the individual interviews. Parents who had never been involved in anything like this before helped to design and shape community responses to family needs. Revelations and insights abounded. From the interviews with families who have succeeded in becoming far more stable, a common pattern emerged of what things had helped them to change life for the better. Their analysis provided a possible model for professionals to use to help more families at an earlier stage. It took nerve and not a little courage to turn up to a workshop with professionals; to air ideas; to listen and to be changed what you heard. This sort of involvement, engagement , designing and learning is immensely powerful for everyone participating. It shows that people, no matter how vulnerable or how complex their lives, can deliberate and analyse with others, offering insights that the professionals could never guess at. The most surprising thing for some professional participants was just how much consensus there was about what needs to be done, when all the different perspectives had been shared and heard. I would love more public services to dare to draw the public in to help with innovation, strategy and planning. I thought - oh I will just watch a few minutes of this - and then I was glued to the whole thing. Riots or peace and well-being?